With the unveiling of the OnePlus 3 rumored to take place on June 14th, time is of the essence as OnePlus looks to dot every "i" and cross every "t" before the phone is introduced. One of the items on the company's to-do list, getting certification from the FCC, can now be scratched off the list as the agency has approved the unit. 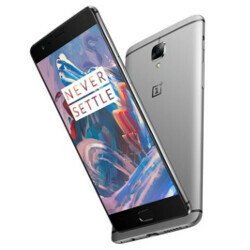 The OnePlus 3, which has also been certified by Chinese regulatory agency TENAA, carries a model number of A3000.Rumored specs include a 5.5-inch AMOLED screen with a 1080 x 1920 resolution. Under the hood, you should find the Snapdragon 820 SoC containing a quad-core 2.15GHz CPU, and the Adreno 530 GPU. 4GB of RAM is said to be inside along with 64GB of native storage. A 16MP camera will be on back, and in front there should be an 8MP selfie shooter. A fingerprint scanner is reportedly embedded in the home button, and a 3000mAh battery will keep the lights on. Android 6.0.1 will be pre-installed. OnePlus is once again streaming the unveiling of its new device in VR. Unlike last year's introduction of the OnePlus 2, viewers will be able to use their VR headset to purchase the OnePlus 3. OnePlus will be sending out the Loop VR headset to those who were able to order one (for the price of shipping only) before inventory ran out. 30,000 units of the AntVR produced device have already been spoken for. So it is only 3000 mAh for the 5.5" display. FAIL. You've already tested it to say that ? Probably not, but yes it's still a FAIL. Your going backwards in battery size? OnePlus One had 3100mah and the One Plus 2 had a 3300mah. I don't care how well optimized a phones software is to get battery life to last longer. The phone still will not get TRUE all day battery where you can do anything from web surfing to games. But, coupling optimizations with bigger battery can get us closer. If the OnePlus 3 with it's 3000mah battery outlast the OnePlus 3 with its 3300mah battery then that is definitely good. But having a 3500+mah battery with the same optimizations is better. Going backwards is not a solution, for me atleast, especially with phones with 4000, 5000, 6050, & even 10000mah batteries. Just as the processor, ram, camera, screen gets upgraded the battery should as well. I agree. If the phone was 5.1", I would have understood the drop in battery size. For a 5.5", this makes no sense. We don't need to test it, we know enough about SN820 to know this is going to be an issue. Its 1080p amoled. Look over at Galaxy A5 (2016) battery life. SD 615 is built on 28nm while SD 820 on 14nm. 820 is way more efficient. Completely different SoC's, not comparable. Then look MI5 but with AMOLED display which is more efficient. Mi5 already gets 92h on GSMArena so I am pretty sure this one will be much better. Lol, wait till you see the MOTO Z with thesame 5.5" with an even higher QHD display on 2,600mah battery. The 5.5in iPhone 6s plus only has a 2750 mAh battery and the battery life is amazing. If the screen is indeed only 1080p then a 3000mah battery should be more than sufficient. I know diffrent soc and all but still it shouldn't be a problem. This phone reminds me of the HTC 10 tbh.. Both boring and generic phones IMO.. Its not like they aren't good or anything its just that I don't find anything exciting about them in anyway. Unlike the GS7E, or MOTO Z especially. just my opinion. It's getting really hard to stand out amongst the crowd these days. The spec sheets are beginning to become very redundant. Even in failure at least LG has accomplished that with the G5. Yeah, I don't want them degrading battry capacity no matter how optimized the hardware may get. I already get great SOT with my OnePlus One with COS 13: https://db.tt/9kQB8lPI But until it reaches 24 hours SOT like flip phones offered over 3+ days of use, shouldn't be reducing capacity IMO. Where are the 6gb of ram gone? Did I miss something? @MrElectrifyer : that's impressive!